Thorn in America's side Osama Bin Laden came to the world's attention on 11 September 2001, when the attacks on the United States left more than 3,000 people dead and hundreds more injured. In a matter of three years, the Saudi-born dissident had emerged from obscurity to become one of the most hated and feared men in the world. 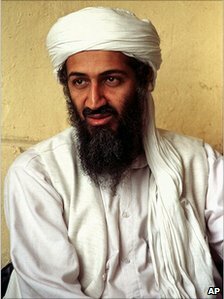 Osama Bin Laden was born in 1957, apparently the 17th of 52 children of Mohamed Bin Laden, a multimillionaire builder responsible for 80% of Saudi Arabia's roads. His father's death in a helicopter crash in 1968 brought the young man a fortune running into many millions of dollars, though considerably less than the widely published estimate of $250m. While studying civil engineering at King Abdul Aziz University in Jeddah, Saudi Arabia, Bin Laden came into contact with teachers and students of the more conservative brand of Islam. Through theological debate and study, he came to embrace fundamentalist Islam as a bulwark against what he saw as the decadence of the West. The Soviet invasion of Afghanistan in December 1979 changed Bin Laden's life forever. He took up the anti-communist cause with a will, moving to Afghanistan where, for a decade, he fought an ultimately victorious campaign with the mujahideen. Intelligence experts believe that the US Central Intelligence Agency played an active role in arming and training the mujahideen, including Bin Laden. The end of the war saw a sea change in his views. His hatred of Moscow shifted to Washington after 300,000 US troops, women among them, were based in Saudi Arabia, home of two of Islam's holiest places, during the 1991 Gulf War against Iraq. Bin Laden vowed to avenge what he saw as blasphemy. Bin Laden was the chief suspect behind the Nairobi embassy bomb Along with many of his mujahideen comrades, he brought his mix of fighting skills and Islamic zeal to many anti-US factions within the Middle East. American pressure ended brief sojourns in Saudi Arabia - which removed his citizenship in 1994 - and then Sudan, and Bin Laden moved back to Afghanistan in January 1996. The country, in a state of anarchy, was home to a diverse range of Islamic groups, including the fundamentalist Taleban militia, which captured the capital Kabul nine months later. Though geographically limited, Bin Laden's wealth, increasing all the time through lucrative worldwide investments, enabled him to finance and control a continuously shifting series of transnational militant alliances through his al-Qaeda network. Sometimes he worked as a broker, organising logistics and providing financial support. At other times, he would run his own violent campaigns. In February 1998, he issued a fatwa - or religious edict - on behalf of the World Front for Jihad Against Jews and Crusaders, stating that killing Americans and their allies was a Muslim duty. Six months later, two bombs rocked the US embassies in Kenya and Tanzania. Some 224 people died and nearly 5,000 were wounded. He was indicted as chief suspect, along with 16 of his colleagues. The 9/11 attacks targeted New York's financial district Almost overnight, Bin Laden became a major thorn in the side of America. A byword for fundamentalist Islamic resistance to Washington, he soon appeared on the FBI's "most wanted" list, with a reward of up to $25m on his head. The US fired 75 sea-launched cruise missiles into six training camps in eastern Afghanistan in a failed attempt to kill him. They missed their target by just one hour. As well as the African bombings, Bin Laden was implicated in the 1993 bombing of the World Trade Center in New York, a 1995 car bomb in the Saudi capital Riyadh and a truck bomb in a Saudi barracks, which killed 19 US soldiers. "I always kill Americans because they kill us," he said. "When we attack Americans, we don't harm other people." In the case of the bombs in Nairobi and Dar es Salaam, his words rang hollow. The vast majority of the dead and injured were African, not American. The arrogance of wealth saw Bin Laden make the government of Kazakhstan a multi-million dollar offer to buy his own tactical nuclear weapon. It comes as no surprise, then, that both the US and Israel are believed to have sent assassination squads after him. Then came the events of 11 September 2001. Two hijacked aircraft smashed into, and destroyed, the twin towers of the World Trade Center in New York. Bin Laden exhorted all Muslims to wage war against America Another aircraft ploughed into the Pentagon in Washington and a fourth crashed in a field in Pennsylvania. Altogether more than 3,000 people died in the attacks, which led to the US-led operation against the Taleban. Allied forces moved into Afghanistan late in 2001. At the time, it was believed that Bin Laden might have been killed during the battle for the Tora Bora cave complex. In reality, he had slipped across the border into Pakistan, a country in which he achieved the sort of cult status usually reserved for pop stars or film actors. In February 2003, an audio tape, purporting to be of Bin Laden, was delivered to the al-Jazeera television company. Of the impending US-led invasion of Iraq, the voice said: "This crusaders' war concerns, first and foremost, all Muslims, regardless of whether the Iraqi socialist party or Saddam remain in power. "All Muslims, especially those in Iraq, should launch a holy war." The US conceded that the voice was probably Bin Laden's. The last known sighting of Bin Laden by anyone other than his very close entourage remains in late 2001 as he prepared to flee from his Tora Bora stronghold. He was widely assumed to have travelled east, across into Pakistan to be given hospitality and shelter by certain local Pashtun tribesmen loyal to the Taleban and opposed to their own government led by President Pervez Musharraf. Bin Laden has carefully timed his media appearances The hunt for Bin Laden took a dramatic turn with the arrest in Pakistan, in 2003, of Khalid Sheikh Mohammed. The head of al-Qaeda's operations and the suspected mastermind of the Twin Towers attack, it seemed as though the net had begun to close in on Bin Laden himself. A major offensive to capture Bin Laden was launched by the Pakistani army along the Afghan border in May-July 2004. But a year later, Mr Musharraf admitted the trail had gone cold. Though al-Qaeda has been prolific in issuing audio messages, often on the internet and featuring the network's second-in-command, Ayman al-Zawahiri, videos of Bin Laden himself have been rare. His appearances have been carefully timed and aimed, analysts say, at influencing Western public opinion by driving a wedge between citizens and their leaders. One such video was issued in 2004 - the same year as the Madrid bombings - and days before the US election. A second surfaced as the sixth anniversary of the 11 September attacks approached, timed to quell rumours that he had been dead for some time. To his supporters, Bin Laden was a fighter for freedom against the US and Israel, not, as he was to many in the West, a terrorist with the blood of thousands of people on his hands.